Increasing temperatures are having substantial impacts on the suitability of coffee systems across Eastern and Central Africa. 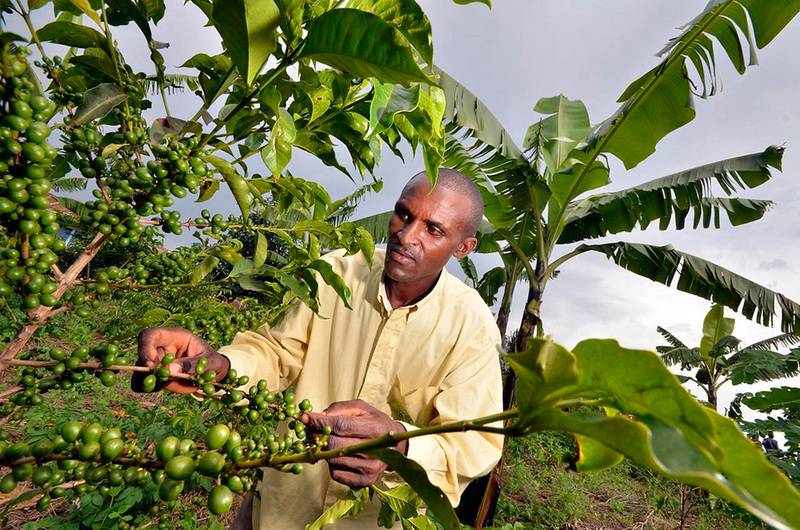 Since 2006, the International Institute for Tropical Agriculture (IITA) has investigated the benefits of the traditional practice of Coffee Banana Intercropping (CBI). On-farm research indicates that growing the two crops together can contribute to all three Climate-Smart Agriculture pillars. In terms of productivity, CBI increases total revenue per unit area by more than 50% compared to monocropped banana or coffee, without affecting coffee yield. Bananas make coffee production systems more diverse, reducing risk while increasing food security during dry seasons. In newly established coffee farms, bananas can offset cash flow constraints in the early years before the coffee becomes productive. In terms of resilience, bananas provide valuable shade coverage for highly climate-sensitive coffee crops. In addition, bananas are capable of remaining hydrated under drought stress, reducing water competition during drought, compared to other shade trees. CBI also mitigates greenhouse gas emissions by increasing above- and below-ground carbon stocks. On average, mixed cropping can sequester around four times the carbon that unshaded monocultures can. Furthermore, the increased productivity of CBI systems reduces overall carbon footprint, as emissions related to agricultural inputs are spread over a larger agricultural output.